How do you manage an event with an online aspect, whatever that aspect may be? Here's my advice. Dublin Docklands Development Authority just don't seem to get "it". The Spencer Tunick photos won't be available until 2009. I mean, seriously? Thank you for making an exceptional art installation, the Spencer Tunick project happen in Dublin Docklands this summer. This event was a tremendous success and as commissioners, Dublin Docklands and Cork Midsummer festival were delighted with how the project caught the public imagination and that so many participants signed up and took part. Spencer Tunick is an extraordinary artist and we were privileged that he accepted the offer to work in Ireland and create some spectacular images. So few artists manage to engage so many people and create such powerful and beautiful images. Now we can’t all wait to see the images! We are now working with Spencer to create an event to exhibit the work in Ireland next year. As a participant, you will receive a print from the installation (Cork or Dublin) in which you took part in spring 2009. We will distribute these to you around the exhibition we host or we will mail them to you at that time. You may recall I wasn't over enthused after my Spencer experience. I'm even less so now. I had a long chat yesterday with the lovely Krishna De as part of the Podcamp Ireland series of podcasts. We talked about using social media to promote and otherwise complement events, with emphasis on the 4daymovie project, but also discussing the SPWC initiative with pix.ie. The event was Saturday June 21. The follow-up thank you email comes 6 weeks later. Why the delay? "We have received so many emails and letters of gratitude and thanks from the participants, we know that this was a special moment in the summer of 2008"
What have they done to foster this? Why not scan and publish some of the letters and quotes online? Create/dedicate a section of their website (where a search for Spencer only brings up legacy articles) that allows people to share their own experiences, to talk about the event and to keep in touch with where Spencer is next. Create a Facebook event page even! The photos in Spring 2009: When Spencer was taking the shots, we joked about him needing a digital camera to speed up the process. Though not a photographer I fail to understand why the images can't be viewed for six months - at least online if nowhere else. Does that mean there was some serious photoshopping of Irish skintones? I understand that an exhibition takes time to prepare, that Spencer is a busy man and that as soon as the photos are released online, they'll be widespread. But, so what? Does that mean that people will think "Ah I won't bother going now" because they see the photo on a website? No. People did the installation for a number of reasons - a personal challenge, a chance to try something different but also a chance to be a part of something. To be able to say "I was there. I took the challenge. I did it." We could have been told that this was going to be the case, we could have been made feel part of that process as well. It's up to the organisers to promote that event as much as it is the participants to make the most of it. Who benefits more? The participants for their experience or Dublin Docklands for the coverage, the promotion and the publicity they're getting. What would you like? Put yourself in the shoes of your participants, your volunteers, your audience and think about what you'd expect, how you'd react, what you'd like to come away from the event with. It constantly amazes me how little this actually seems to be done. Looking after your sponsors is important, but unless people enjoy the event, what's the point? Ask for help Don't do it badly yourself - get other people - your team, your volunteers, your friends involved and ask them for advice, for help in seeing the wood from the trees and for that added extra eye over things. Look at what others have done. There are so many great events in Ireland - think of what they've done to foster that sense of "I was there and it was great". Allow people to talk about it. Give them somewhere to give feedback, to say "That was great" and thank them for doing so. Dublin Docklands - why wait until Spring to hold an event for people? Ask people to share their experiences, collect them into a book, publish it for charity, invite the participants to the launch. All that work? A bit of time. The good Word-of-mouth/word-of-mouse you get afterwards? Priceless. Say thank you to everyone. 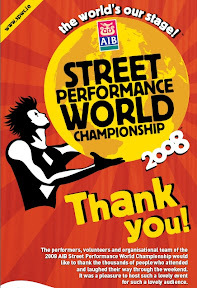 I particularly like the way the Street Performance World Championships followed up their newspaper ads announcing the event with this advertisement thanking people for being there, for being part of it, for attending and laughing their way through the weekend. It gives that "aww" factor, it lends to the good feeling someone has and it gives them something to talk about. Keep people informed. If so many people had such a good time, consider they might like to hear about what's going on, what the next step is, if they can help etc. Be kind to your fans. People (volunteers especially) can be enthusiastic, excited and interested in helping out. That may be a hindrance sometimes but in the long run it's worth it. The Dublin Writers Festival brought us out to dinner recently in Eden of Temple Bar as a thank you. Thanks to Pix.ie the SPWC have an absolute deluge of great photos to choose from. Niamh sent the Dublin Burlesque Ball a Facebook message this morning after attending on Sunday night, saying "thanks, here's a link to my photos, any idea of when yours will be ready?" They replied this morning saying "Thanks for coming to the Dublin Burlesque Ball and for the pics. Glad to hear you and your friends had such a great time. Please watch our coming events information here on Facebook. Our official pics will be ready next week." That's just brilliant. Very importantly is managing things online properly. Stickler that I am, I like things to be done properly. I can understand Damien's annoyance at the Darklight Film Festival for how they handled their mailing lists and he's right - ignorance of the law is not an excuse. Resource may be, but again - ask for help! Do not put all the email addresses in the "to" field, do not have wrong information that requires a follow-up email to say sorry and please please please spell check and read before you send. I certainly won't. Nor have I come away with a good feeling about this. A pity. A real pity. I've emailed the DDDA with this article and an offer for help. I'll let you know what they come back with. Thank you is such a little phrase, yet it warms hearts and means so much. Thank you Darragh, another good post. It's a shame it's going to take so long to see the final result of the Tunick thing. But fair play for the excellent advice that may ensure the faux pas won't happen again. Great post! Yeah that is a bit crap alright, I doubt so many people would have taken part if they realised they'd be treated so shabbily. Very good post. By the way, just re-read that Mulley post you linked to and read the comments too. He's an awful silly crabby fucker really, isn't he? I wouldn't have taken someone talking to me like that at all. artists are 'tempermental' (something i've never understood - i'm an artist. i dont 'think' i'm tempermental) It could be that his promo people cant put things up because he prohibits online images of his work. OR it could be that he's relying on them to do it and has no clue how inept they are. reminds me of many of my favorite bands - their websites, fan forums, merchandising and especially Myspaces are run by people who cant even do a basic link to something without screwing it up. Especially the myspaces. Well put Darragh. Yes my heart sank when I got that email - it really feels like a bit of a swizz. I'm still glad I did it, but I agree with all of that. It wouldn't have hurt them to be a bit more savvy. Thanks Darragh, and well done. Do not rely to this mail?? Should that no be di not rely on a speedy turnaround??!! I'm sure they could have invested in a spellchecker??!! Good post, it is disheartning when you're eagerly anticipating seeing pictures/teh results of something you took part in for it to turn out like this. I understand your frustration, and as a participant at Blarney, I am also a bit disappointed that I will have to wait that long. However, it is important to look at the situation from the point of view of the artist and the organisers. Dublin Docklands, Cork Festival and Spencer Tunick are coming together to create an exhibition of the works documented in June. The effort required to organise this is far more than we individuals think, and the process takes time and investment. Now, I can not speak for either the organisers or the artist, but having run a Spencer Tunick appreciation website and forum for the last 5 years, I do know that Spencer is very meticulous about timing events and does not like any information or images released before the official date, and this includes model prints. I completely understand and agree with this. It would almost be like releasing the last ten minutes of a blockbuster movie a year before the rest of the film, or having someone steal the master tapes of a much anticipated album and posting it on the web for people to download before the official release date. I can assure you that there will be no "photoshopping of Irish skintones", and digital cameras will not speed up the process for the reasons I stated above. Like I said, I can not speak on behalf of Dublin Docklands, and I think a thank you should have gone out much sooner. I don't recall receiving an email from Cork Midsummer Festival either. So I agree with you on that count. But I would much rather wait for my model print and to see the other prints and video documentation, when Spencer Tunick and the organisers are ready to reveal them - whenever that time may be, rather than see a few spoilers now and having it be "old hat" by the time the exhibition comes around, because regardless of what you may think - it will have a negative impact on the number of visitors to the exhibition, and it will essentially mean that a lot of time and money invested by the organisers will go down the drain. So have patience and savour your memories of the installation until such time that the artwork will be revealed. Not that I know a lot about how to run events or do pr correctly but what gil says makes a lot of sense to me. Meh, I think it's all the height of narcissism and vanity really, but to address your issue, I'd put a call into the Press Officer in the DDA and ask why there will be such a delay in this day and age. Surely it would be possible to electronically distribute a lowres version of the result and then distribute the print subsequently. Jaysus, if I was really pushed I'd send of a communication to Spence himself and ask why the flip it's talking so long. There may be copyright issues delaying the pubications, I mean publication.